Not in your heart Pope to Politicians: Defend Life! From start to finish, the life of Christ on earth reveals how the devil pursued Him — from Herod to Judas. The ancient serpent is unrelenting in his temptation of priests to mock Christ, to cease the perpetual sacrifice, and to render the Church impotent. Indeed the Church would be impotent without her ministers of the Sacraments: no priests, no Eucharist; no forgiveness of sins. Satan is a dealer of doubt, a sower of dissent, a divider, and a deceiver. Sexual sin and moral disorder are definitely the devil’s playground — and yes, even priests go there. That’s why priests have dire need of strong spiritual armor reinforced by the prayers and fasting of God’s people. It’s why informed Catholics are not surprised to be told, “You must always carry a special place in your prayers and in your heart for the sanctification of the priesthood and the sacredness of the Mass” (Fr. Gerald M.C. Fitzgerald, quoted by Fr. John Hardon, S.J.). There is an intimate unity between priests and the Eucharist. Every prayer that we offer for the holiness of priests helps to protect them and the Eucharist from demonic profanation. I have personally witnessed that during an exorcism a demon is sometimes forced to attest to his hatred toward priests because of the Eucharist. “The devil knows that every Mass gives immeasurable glory to the Divine Majesty, which he hates. So he does everything in his power to seduce priests in his camp so they will not offer Mass, or offer it less often, or less devoutly; anything to prevent God from being given the glory and souls from receiving the graces that flow from the Holy Sacrifice of the Mass,” wrote Fr. John Hardon. One example of a diabolical attack against a priest and the Eucharist is the case of French priest Fr. Jacques Hamel of recent history, who was murdered at the altar in the middle of a Mass. Eyewitness Sr. Danielle confirmed that, before dying, Fr. Hamel called out twice, “Be gone, Satan!” She added that “this does not mean that [the assailant] Adel Kermiche was possessed, but that Satan was at work in a powerful way. Father Jacques wanted to exorcise this evil. Those were his last words. Satan does not like the Eucharist” (quoted in Elizabeth Scalia, “Eyewitness Report: Father Jacques Hamel’s Last Moments,” Aleteia, 4 Oct. 2016). The cause for the beatification of Fr. Jacques Hamel has begun. While a few priests are instruments of abuse (and even one is too many), other priests, in growing numbers, are heroically lifting up the Church by laying down their lives for the Faith. Having taught priests over 30 years, having lived with priests, and having labored for them, loving them and suffering with them — no words I can use would be too strong to state that the Catholic priesthood needs prayer and sacrifice as never before since Calvary. One saint after another has declared that the devil’s principal target on earth is the Catholic priest. Priests need, Lord how they need, special graces from God. We ask, why pray, then, for priests? We should pray for priests and bishops because this has been the practice of the Church since apostolic times. It’s a matter of revealed truth. It is a divine mandate. The imagery of spiritual warfare is intentional because the Church Militant is in a battle against the world, the flesh, and the devil, as St. Paul taught (Eph. 6:12). Because I serve on an exorcist priest team, I witness the diabolical rage, cunning demonic mockery and traps set against priests. During the rite of exorcism we see the blatant aversion that demons have to the priest and the Eucharist: (the stole elicits diabolical screams), the Eucharist (demons cry out, “It burns me!”), and sacramentals such as the Rosary and holy water (elicits shrieking). The devil seeks to tear priests away from Christ and stifle vocations. If he strikes the shepherd, the starving sheep are easy prey. For spiritual battles, God chose the Virgin Mary to crush the head of the serpent. She is the Queen Mother, fierce in battle, building an army for the King. We can bring priests to the Immaculate Heart for healing and strengthening. We implore the Virgin Mary to help us see priests with her eyes: “For her, a priest is always a priest, a living image of her Son, and if that image is disfigured by sin, she only has a more ardent desire to give him back that resemblance to Christ, for she sees him as God sees him” (Fr. Fredrick L. Miller, The Grace of Ars, 141). St. John Vianney, patron of all clergy, preached on the unrelenting diabolical and human attacks against priests, sacrifice, and religion. “And, Pope Paul VI publicly lamented that the smoke of Satan had even entered the Church. The warning redresses what has already become the quandary of Vianney’s progressive culture.” It’s remarkable that God’s remedy for the quandary of France’s progressive culture was a humble, courageous priest who is now the patron of all priests. His example cannot be forgotten! More than ever we need his witness, his intercession, in order to face the situations of our times, when, in spite of a certain number of hopeful signs, evangelization is being contradicted by a growing secularization, when spiritual discipline is being neglected, when many are losing sight of the Kingdom of God, when often even in the pastoral ministry, there is a too exclusive concern for the social aspect, for temporal aims. In the last century, the Curé of Ars had to face difficulties which were perhaps of a different kind but which were no less serious. God permitted St. John Vianney, like Job, to be vexed, tormented, by the devil, who tried to ruin him and his flock. “In the extraordinary events in Ars, which began in 1824 and lasted until a year before the saint’s death, the terror and wonder of the confrontation between good and evil were palpable,” wrote Fr. Rutler. Today the battle between light and darkness is raging far beyond the town of Ars, France. An incident from the life of St. John Vianney illustrates how clergy are God’s essential soldiers. It was necessary for the saint to perform an exorcism when a woman hurled herself at him, shouting in a diabolical voice, “If there were three like you on earth, my kingdom would be destroyed. You have taken more than eighty thousand souls from me” (Fr. George Rutler, The Cure D’Ars Today, 174) Let us beg God for more priests like St. John Vianney. 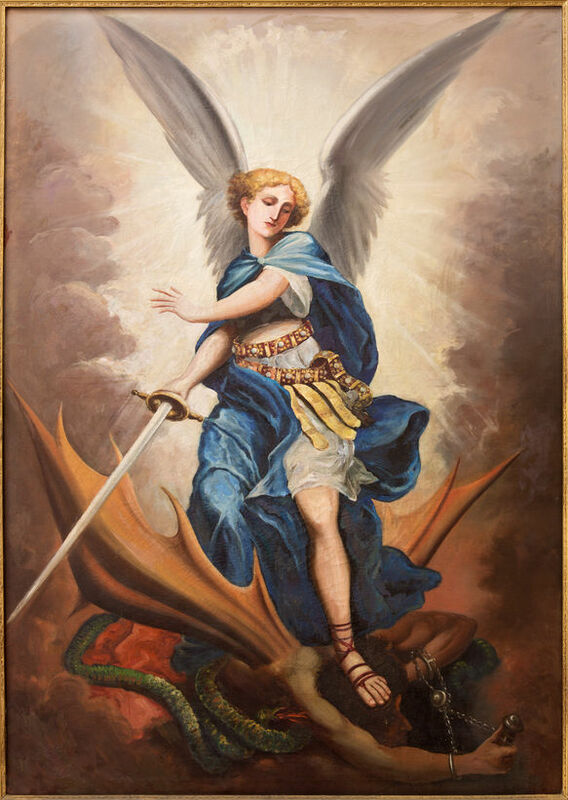 “The evil one terrorizes no one as much as he is terrified by Christ the Victor; a losing foe can still win incidental battles before the war’s end, but the outcome for the world is certain even when individual fates are not” (Fr. George Rutler). We proclaim Christ’s victory with every prayer and sacrifice on behalf of His priests because our offering strengthens the watchmen, priests, called to be warriors for Christ; called to build up the Church for “such a time as this” (Es 4:14). Jesus to a Benedictine monk: “The renewal of My priesthood in the Church will begin from the fire of love that blazes in the Sacrament of My Body and Blood. I am close to you now, and you are close to Me in the Sacrament of My love. I accept your presence here tonight as an offering of friendship and reparation for the sake of all My priests and brothers. Tonight I look for them. I wait for each one to seek Me out. I continue to yearn that My chosen ones, even those who have allowed their hearts to grow hard against Me, will be converted tonight and find their way to My Tabernacle where I wait for them. Adore Me for the sake of your brother priests who do not adore Me. Let me give you what I would give each of them. Accept My love. Receive My divine friendship” (In Sinu Jesu, 48-49). Reprinted with the kind permission of Catholic Exchange.